The moon gate that leads to the check-in desk at Chuan Spa, Langham Chicago. 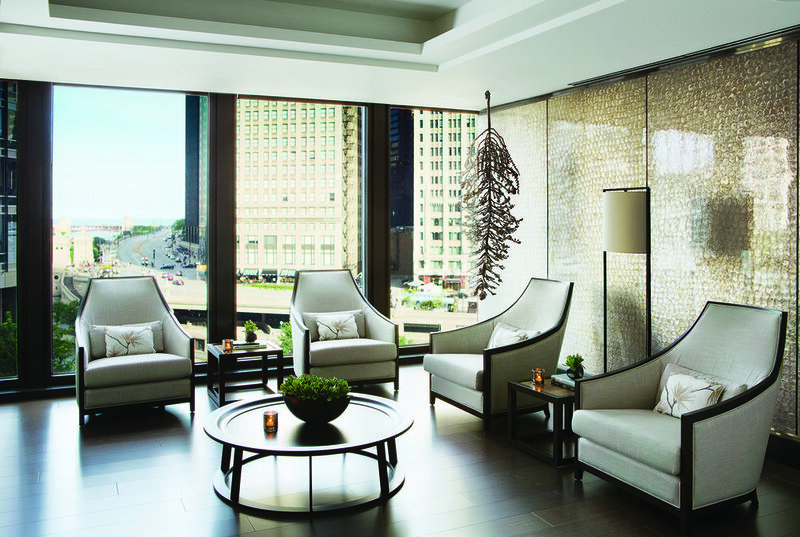 Located in the heart of Chicago, the five-star contemporary hotel The Langham Chicago offers sweeping views of Lake Michigan and is a short distance away from Millennium Park. In addition to luxurious services and amenities, it is also home to the award-winning Chuan Spa—a soothing oasis of tranquility that inspires contemplation and introspection. Why You’ll Love It: Not only are our facilities stunning as Illinois’ first and only Forbes Travel Guide Rated Five-Star Spa and Hotel, but it’s our people that perform on that beautiful stage, engaging with our guests, building relationships and once-in-a-lifetime memories that stand out most to our guests. Additionally, our contemporary Oriental-designed Spa creates an opulent retreat from the chaos of the outside world, and many guests are attracted to our genuine and authentic approach of our incorporation of Traditional Chinese Medicine at a luxury level into all that we do. Key Features: Luxurious personal care amenities within each locker room; 67’ indoor lap pool and hot tub with Spa cuisine available poolside; state-of-the-art fitness center and group fitness class studio boasting 21+ fitness, wellness, and mind-body-spirit classes each week. Guests can also enjoy the Chuan Journey: Before your treatment, embark on a natural water journey–the Chuan Bathing Ritual. Located within each gender-separate changing room is a series of rooms designed to reinvigorate the body’s reaction to hot and cold stimuli, creating deeper dimensions of relaxation, health, and well-being. This ritual begins with an aromatic sensory and moderate heat experience in the Herbal Sauna, allowing the heat to loosen and soothe tightened, congested muscles and the herbs to open the respiratory system. For more intense heat, relax in the Salt Stone Sauna, which releases negative ions to create a fresh and clean, bacteria-free environment. Blocks of pure Himalayan salt stone line the wall, creating a calming environment and assisting in reducing stress, and respiratory and skin ailments. Transition to our Experience Shower to awaken your spirit with invigorating aromatherapies. Then enter our Oriental Steam Room, where you will be greeted by the soothing scent of chamomile. Linger longer on one of the ergonomically designed relaxation recliners, radiating soft warmth directly on your body to create a sense of harmony. Bonus: Guest celebrating a special occasion with us will receive a complimentary glass of prosecco and signature Langham chocolates following their treatment. Insider’s Tip: If your schedule allows, schedule your spa service in the morning on a mid-week day. You can come for an incredible hour-long results-driven treatment or much more, and make an entire spa day of it with a poolside lunch, catching a workout before or after treatment, joining one of our many daily fitness or wellness classes, and taking time for one’s self in the many heat experiences located within each of the gender separate locker rooms. The Spa’s ultra-luxurious Spirit Suite. Snacks Served: Guests can enjoy fresh fruits, dried nuts and berries, in addition to three different antioxidant-infused waters by Pure Inventions. We also have our very own Chuan Signature Tea offering five different varieties: one corresponding to each of the five elements, each promoting a different health benefit. A full Spa Cuisine menu is also available for poolside service. Unique Treatment: Traditional Chinese Medical Consultation and Treatments. Chinese master practitioners use cultural beliefs to interpret the states of well-being. Any disharmony of the equilibrium of Yin and Yang, or disturbance in their flow of Qi can cause imbalance. The task of a Chinese Master of Acupuncture and Oriental Medicine is to restore such imbalance. Some treatments include acupuncture, Moxibustion and Ho Guan (cupping). The aim is to supplement the deficiency of either Yin or Yang or to reduce the excess. The holistic approach of Chinese medicine is to treat the body as a whole and address any imbalance. Acupuncture + Adjunct Therapy + Massage Therapy - One of the following adjunct TCM therapies can be added to a patient’s Acupuncture and Massage Therapy treatment to enhance the overall benefits. The use of these adjunct TCM therapies can be seamlessly incorporated into one’s Acupuncture and Massage Therapy treatment at the recommendation of our Master of Acupuncture and Oriental Medicine upon initial consultation. Ho Guan (Cupping) - Cupping refers to an ancient Chinese practice in which a heated cup is applied to the skin and the pressure in the cup has therapeutic effects on the skin and superficial muscle layer. Cupping is applied to certain acupressure points, as well as to regions of the body that are affected by pain. Moxibustion - An ancient traditional Chinese technique to help strengthen the blood and stimulate the flow of ‘Qi’ to maintain general health. Moxibustion involves the burning of a small, spongy Chinese herb known as moxa to facilitate healing. The Master of Acupuncture and Oriental Medicine will light one end of a moxa stick and hold it close to an acupressure point for several minutes to bring about a pleasant heat sensation penetrating deeply into the skin. Gua Sha - As a traditional Chinese treatment, the Master of Acupuncture and Oriental Medicine will repeat pressured strokes over the body in which the skin is scraped to stimulate blood flow and healing. Practitioners believe Gua Sha releases unhealthy elements from injured areas of the body and promotes wellness. The swimming pool at Langham Chicago. Splurge Treatment: The two-hour long Chuan Chicago Signature Escape: 5 Wu Xing Elements In-One. At the chime of traditional metal Chinese Bianzhong Bells, your elemental journey begins. A light application of fiery, Chuan Clove Thermal Balm is applied to key pressure points. Heated wooden Chinese bamboo reeds are then used to stimulate meridian harmony, combining the therapeutic elements of acupressure with various relaxation massage techniques, inducing a deep sense of calm. Relax as your entire body is then enveloped in Chuan Element of The Season Mud from the Earth, allowing the therapeutic elements and essential oils to infuse. Your stress will evaporate as your scalp is gently massaged with an intensive hair repair masque with keratin amino acids and rich emollients. Heated towels immersed in warm elemental waters are used to cleanse the skin prior to a hydrating full body lotion application, completing this well-rounded journey through the five Traditional Chinese Elements of Wu Xing, resulting in the ultimate sense of well-being and relaxation. ($400/peak; $375 off-peak). Insider’s Favorite: Sacred Nature. Not only is this my personal favorite, but it’s also a favorite among guests and therapists alike due to its completely unique and custom blend of the caring approach of Esalen massage and the Bioenergetic-Shen approach, developed with an advanced teaching in Italy and in the United States. Additionally, this treatment being safe for expectant mothers gives other options to your typical pre-natal massage in a ritualistic experience. The ritual views the human body as a powerful tree: the legs and feet are the roots, the arms are the branches, and the body overall like the inner rings that tell the story of the life of the tree from infancy to the present moment. The movements of this ritual give strength and stability, fluidity and openness, while bestowing deep relaxation. When personally receiving this treatment, I feel like my mother is wrapping her arms around me with love and care, which also evokes a deep emotional response. A couples treatment room at the Spa. Featured Products: Comfort Zone, HydroPeptide, Kerstin Florian International, and Skin Regimen. Open daily from 9 a.m. - 9 p.m.